My name is Mike Sullivan and for many years I have collected militaria with a special interest in the French Foreign Legion, particularly the Legion's badges which reflect the history, glory and traditions of this elite unit. On my site you will find insignia from the common to the very rare for sale to help you either start a collection or find a rare, special item. 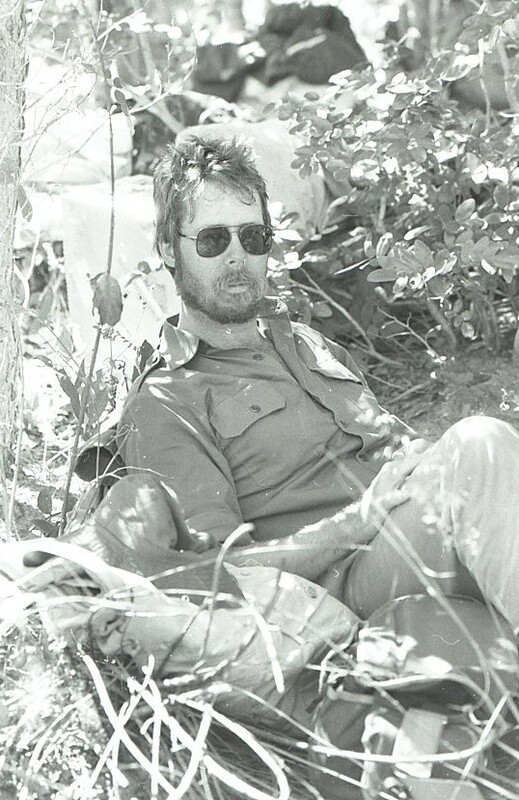 On assignment in Angola in the 1980s on my way to visit UNITA leader Jonas Savimbi at his headquarters. The best way to reach me is via e-mail at mike@legionantiques.com with any requests as it may take some time to catalog and photograph all my insignia and other items. Please be specific re Legion insignia. Do not add any attachments to your e-mail as they will not be opened. Please contact me for any additional photos on any items. New "Miscellaneous" page added with neat non-Legion items from Africa. Check it out. New page "Pennants" page added with 2 beautiful personalized Legion pennants, perfect centerpieces for any Legion badge collection! After 2 years overseas I am back in the States and open for business. I know the site is a mess and badly needs updating but don't hesitate to contact me! I look forward to dealing with lovers of all things Legion!! Copyright 2010 Legion Antiques. All rights reserved.